The simplest way to get MIDI out of your guitar with good note detection and string-bend tracking. 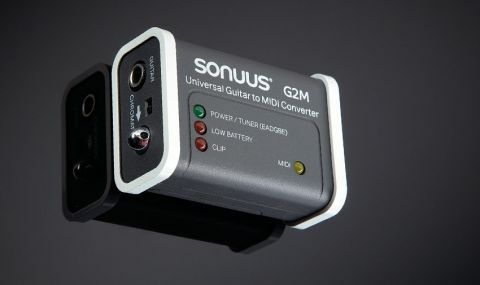 The Sonuus G2M is the least expensive and also the simplest way to get MIDI from your guitar - it takes the signal from the guitar's jack socket and converts it directly to MIDI. "The G2M is great for recording anything monophonic"
The downside is the G2M is monophonic, so you can only play single notes, unlike a hex pickup system that detects all six strings. The G2M is great for recording anything monophonic, and you can just plug into a synth and play its sounds or play hybrid synth/ guitar via the G2M's thru jack. If you want pitch-to-MIDI conversion and aren't bothered about chords or don't want to stick a hex pickup on your guitar, the G2M is perfect.